This book is only available in printed form. All books are print-on-demand. Please allow 1-2 weeks for delivery. 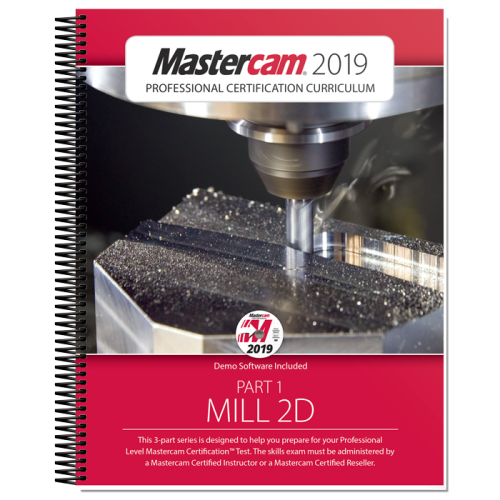 This book is the first one in the 3-part series curriculum design to prepare you for the Professional Level Mastercam Certification Test. The book introduces the 2D design commands through simple training exercises followed by project based parts that are using the explained commands. The 2D toolpaths used to machine the parts follows. Challenging exercises are provided after each part. It starts by introducing you to Mastercam user interface and basic geometry commands and toolpaths. It gradually progresses into more complex concepts such as geometry manipulation, levels, multiple setups and 2D High Speeds Toolpaths. You will also learn how to import a CAD part and how to analyze geometry and fix any problems. All the parts within the book are designed with machinability in mind. IMPORTANT: Merely reading this book does not make you Mastercam Professionally Certified. You must arrange testing with your local Mastercam reseller or certified instructor and pay any applicable fees to them. Purchasing this book does not automatically entitle you to testing or exams, it is intended to teach you the skills to prepare you for testing if you choose pursue it. The lessons taught are still useful even without completing the exam.